After missing out on the MIAA’s four-team conference tournament via a tiebreaker in 2013, the Belles focused on staking their claim to a top-four spot in 2014. Saint Mary’s succeeded in snagging the fourth seed in the tournament and ended the year with a 5-3 conference record. Saint Mary’s junior Kayle Sexton unleashes a serve during the Belles’ 8-1 loss to Hope on April 17. Led at No. 1 singles by senior co-captain Mary Catherine Faller, the Belles (11-8, 5-3 MIAA) posted a record of 11-8 and improved their finish in the conference standings for the third consecutive season. Saint Mary’s finished sixth in 2012 and fifth after the tiebreaker was applied last season. This year, the Belles finally broke into the league’s top four. After starting the year slowly at 1-2, the Belles quickly righted the ship, rattling off five wins in their next six games to establish a winning record that they would not relinquish for the rest of the season. Sophomore Andrea Fetters made an immediate impact in her first season with the team, moving her way up from No. 6 to No. 4 singles en route to a 12-3 record in singles matches during the spring season. 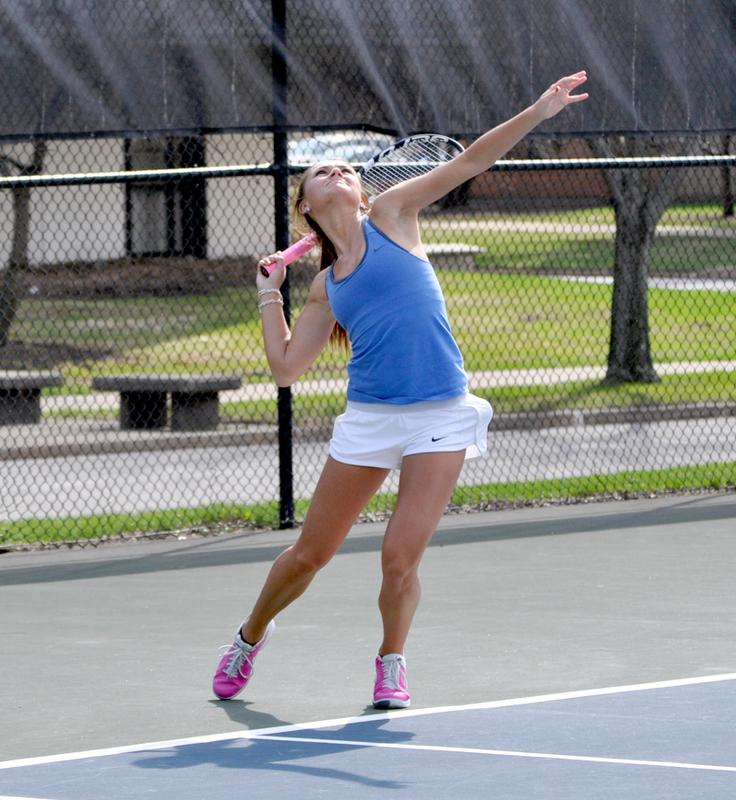 Fetters was key to the Belles’ victory over Calvin on April 23. She won her singles match at the No. 5 spot and her doubles match with sophomore Margaret Faller. With the victory over the Knights (6-11, 4-4), the Belles clinched a playoff berth and secured a ninth consecutive season of 10 or more victories. In the MIAA tournament, the Belles lost to top-seeded Kalamazoo, who went on to lose to Hope in the conference title match, 5-1. The Belles picked up a victory at No. 1 doubles, and when the No. 2 doubles match went to a tiebreaker, Saint Mary’s had an opportunity to grab its first lead of the match. But Kalamazoo took the win and then won three singles matches in a row to secure the team victory. The Belles will lose just one player — Faller — to graduation and will aim to return to the MIAA tournament next year.